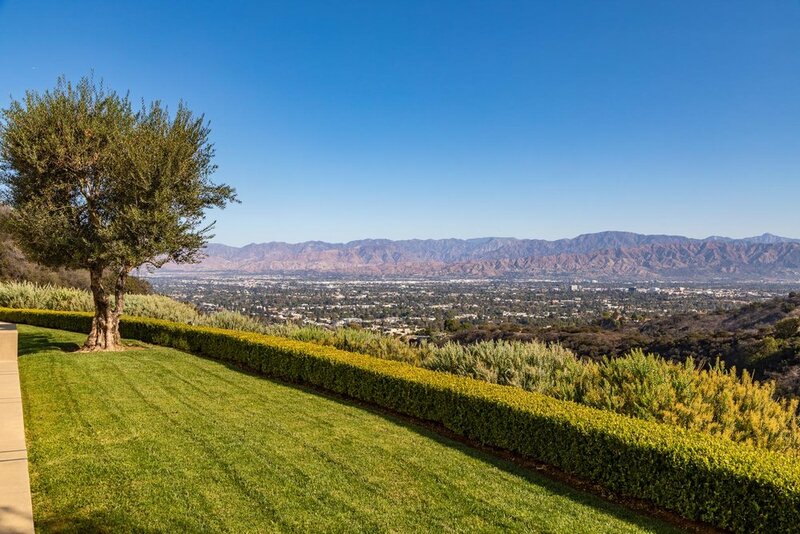 Contemporary masterpiece with sweeping panoramic views. Located down a long gated drive for maximum privacy, this magnificent Modern home has five bedroom and six baths. Designed by the renowned firm of Montalba Architects with Interiors by Aboud Malak and Thinkpure. Rich materials of limestone, natural woods and medal casement doors are used throughout along with sensational walls for art. All public rooms expose the jetliner views allowing for the quintessential California indoor/outdoor experience. Sun filled living room with fireplace and access to a covered logia with an outdoor fireplace. Large formal dining room, open media room and gourmet eat-in kitchen with custom Italian cabinetry and top-of-the-line appliances. Magnificent master suite with attached office, dual closets and gorgeous resort-like bath with patio. Large beautiful yard with mature landscaping, stunning pool and spa, BBQ and outdoor wine room, all overlooking the exquisite mountain and valley views. Chic and sophisticated living! 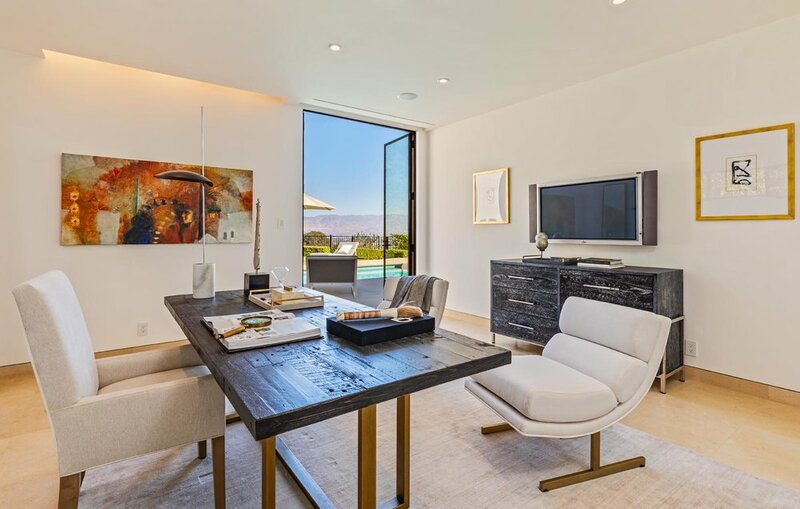 Contemporary masterpiece with sweeping panoramic views. 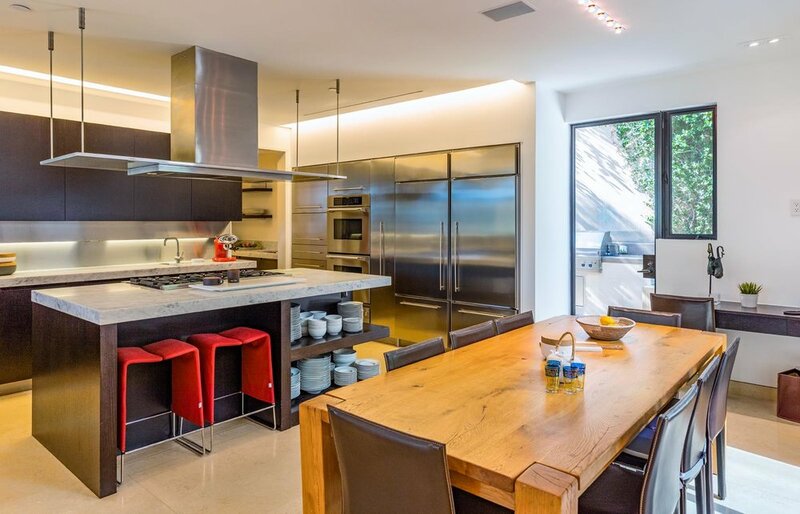 Located down a long gated drive for maximum privacy, this magnificent Modern home has five bedroom and six baths. Designed by the renowned firm of Montalba Architects with Interiors by Aboud Malak and Thinkpure. Rich materials of limestone, natural woods and metal casement doors are used throughout along with sensational walls for art. All public rooms expose the jetliner views allowing for the quintessential California indoor/outdoor experience. Sun filled living room with fireplace and access to a covered loggia with an outdoor fireplace. Large formal dining room, open media room and gourmet eat-in kitchen with custom Italian cabinetry and top-of-the-line appliances. Magnificent master suite with attached office, dual closets and gorgeous resort-like bath with patio. Large beautiful yard with mature landscaping, stunning pool and spa, BBQ and outdoor wine room, all overlooking the exquisite mountain and valley views. Chic and sophisticated living!